Meg Saligman's viral mural of Tom Brady and one very big bird on Bainbridge Street. 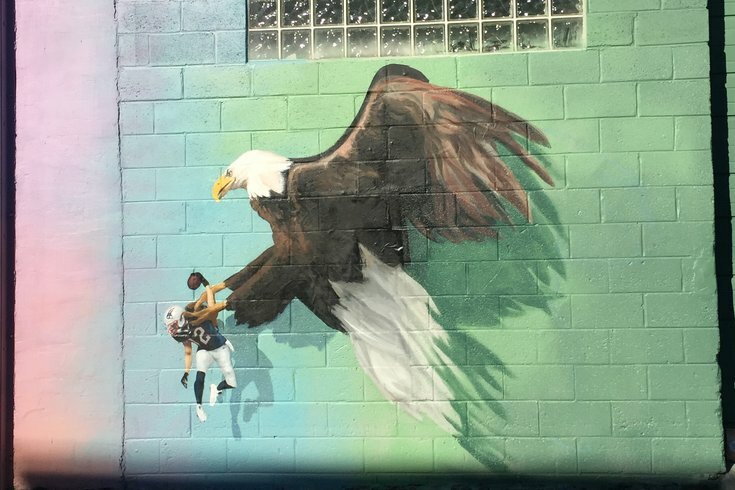 If you don't know Meg Saligman by name, you most certainly know her by her work – namely, "Bird Feed," the mural depicting a giant eagle scooping up Tom Brady on Bainbridge Street. Saligman is also behind the permanent Super Bowl LII mural on the Hale Building at 1326 Chestnut, along with many other works created over the years. Following the success of her Eagles mural, Saligman is now inviting fans to take a peek into her work with a new project called "Into The Mural," an installation that doubles as a hands-on experience for visitors. Beginning Friday, Feb. 22 at 829 Bainbridge St. (Saligman's studio, and the home of "Bird Feed"), the new attraction will be open to the public for an all-ages journey through the studio. Saligman promises a look into the art of mural-making, a scavenger hunt, and the chance to create your own art in an installation that's part art immersion, part escape room. "Explore the depths of the artist's closet, delight in participatory art-making using light and shadow, watch animated characters come to life at every turn, and enjoy yourself in a unique and transformative way," the studio said in a press release. The permanent attraction will officially open at 11:30 a.m. on Feb. 21 and stay open through 5 p.m.
Tickets are available here and start at $8.